The first thing I learned was that adding beads to string makes the string way, way more tangle-y than just string alone. Since I was adding a full set of beads to each knot in the sinnet, key to success was to ensure that the knot formed tightly before it got anywhere near the beads and just locked them down. I also learned how to use my fingers almost like the prongs on a French knitting spool. I formed the starting loop, the loop that was going to be laced through, over my thumb and then pinched the thread that was going to do the lacing between my thumb and index finger so the extra manipulation involved in pulling it up and then through didn't destabilize the linking of the other threads. After I figured these things out there was far less tangling. In the mean time, I managed to develop a rhythm of crowning with the beads with just my hands that ticked along reasonably well and finished both the sampler and my favourite colour scheme to bracelet length. I had thought that I was going to tie a somewhat involved knot with the beaded cord, but for the length of beaded braid I generated, it ended up too thick to tie any but the simplest knots and I didn't want to just make a longer cord because the resulting knot would be huge and heavy. I'm still mulling over ideas for efficiency and final product, but the samples and experiments are interesting enough to share already IMHO. 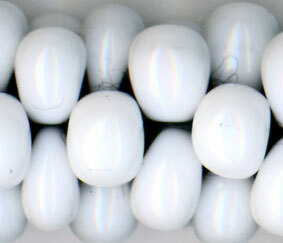 First up is a mildly irridescent light blue silver lined Czech seed bead. 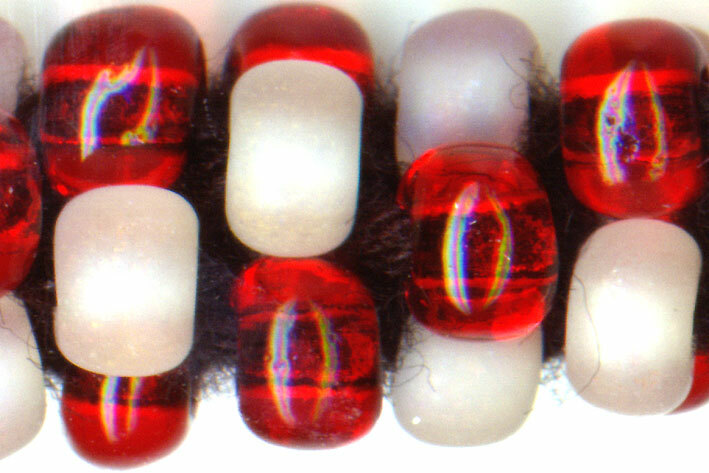 It was interesting and gave this nifty bead slices effect where each ring of beads were distinctly separated from the next by the visible band of black where the knot was. 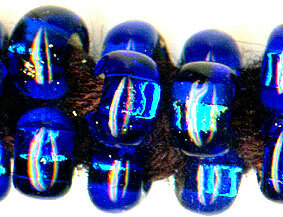 Next is a slightly larger bead, silver lined dark blue. In a bit of forgetfulness, I managed to string only 3 of my strands with this colour of bead. All the other colours went onto all 4 strands, so I simply crowned the 3 beaded strands and ran the 4th strand through as a core. The beaded slice effect is much lessened and due to using 3 strands and a core, it seems that more of the yarn cord is visible giving a more bead studded effect. 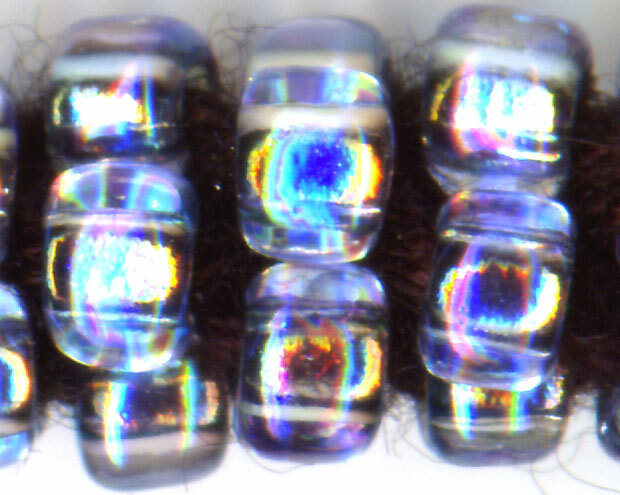 It would be interesting to deliberately bring out that aspect by either using a significant core size or increasing the number of strands and crowning with beaded and unbeaded strands... In any case, the combination of dark and sparkly really caught my eye, here. 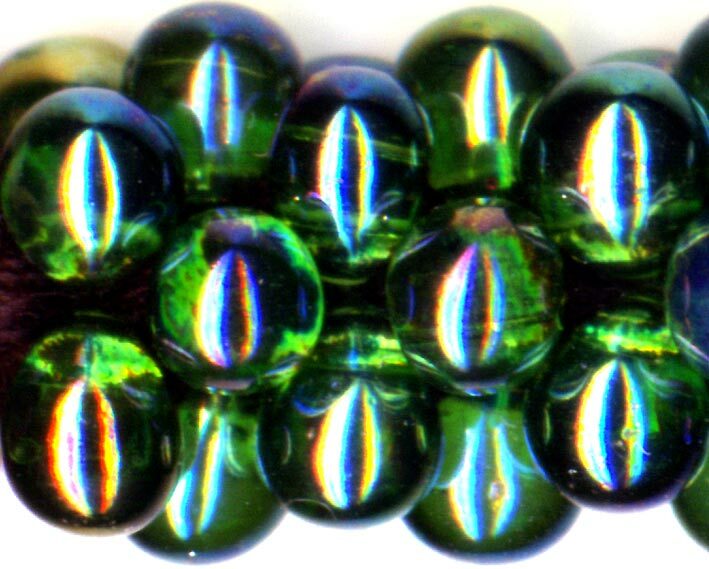 Next was a conical tip drilled Czech drop bead in an oily iridescent green. 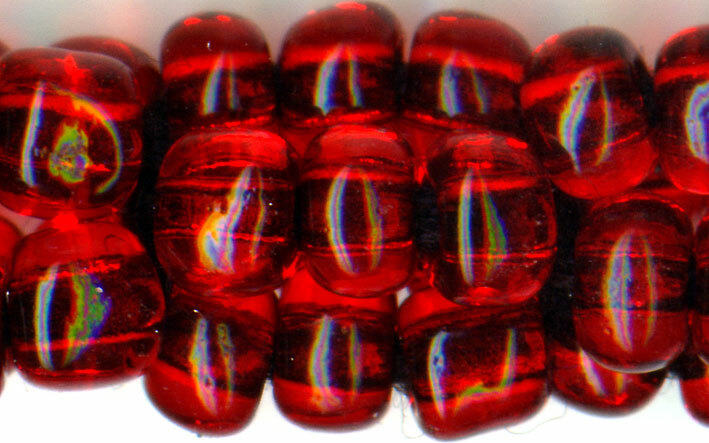 These had the smallest holes and would occasionally require force to move over the needle/yarn join. The pops there made me worried that the glass might be breaking and unbalance my pre-threaded bead arrangement, but no such problem. All the beads remained intact. The resulting bead arrangement completely covers the yarn even when you pick it up and flex it. From a slight distance it gives me a dragon scale feeling. 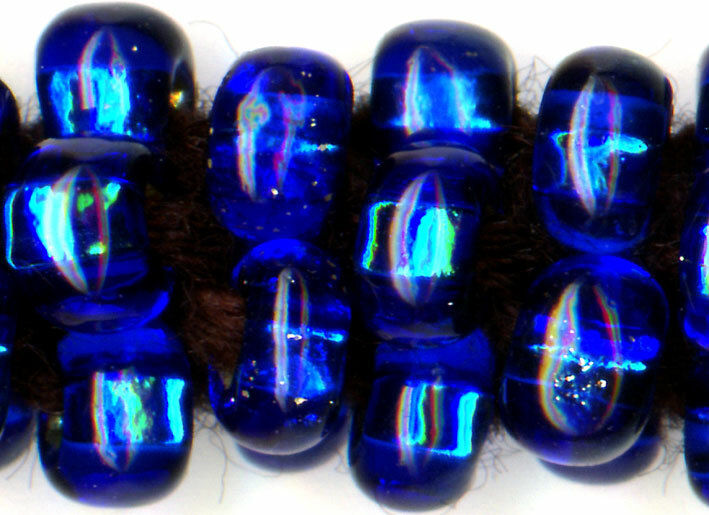 Gorgeous, but I only had a small bag of those beads which were purchased in another country. 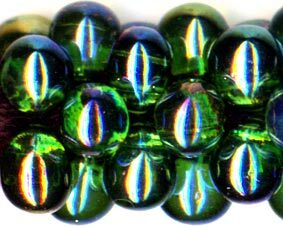 I will have to do some hunting to see where I might get similar beads locally or buy them online. 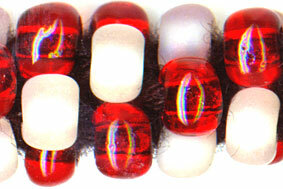 Next were some transparent red and frosted white beads. I started in and the expected spiral formed exactly as expected along with the bead slice effect so I decided to change it up by crowning after every 3 set of beads instead of every single set. 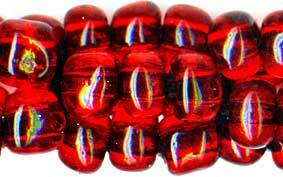 I was hoping to create a more beaded bead effect. Lastly, I used a large-ish white magatama drop bead through which you can definitely see the yarn. I wonder if I used smaller magatamas if I would get an effect similar to the Czech drops or if it would remain more like the round beads due to structure.